The above info came from Kirbyfan106, and was edited by yours truly (contact me). The image came from photobucket. 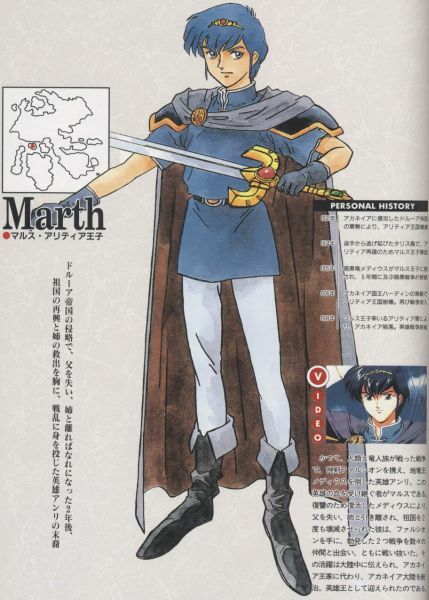 Marth, a.k.a. Mars, is the betrayed prince of the kingdom of Aritia (Altea in the game), whose veins carry the blood of legendary hero Anri. Afterwards, Aritia was annihilated by King Hardin of Orleans, who had been possessed by Medeus after the dark dragon himself was defeated. Marth, of course, learned of this and freed Hardin from Medeus' posession, though letting Hardin die in the process. Then, Marth's army advanced to Durhua where Marth and the revived Medeus in his true form began their final battle. Marth's power of light was able to weaken Medeus' dark power, and with a strike from Falchion, Medeus was destroyed forever. After that, Marth returned to Aritia to rebuild it and the rest of the world, and he was able to rule in peace for the rest of his days. Marth's father King Cornelius comes off as being rather abusive, and his sister Ellis seems to be a gentle confidante in his times of need. He also received Ellis's tiara as a parting gift when she was kidnapped by Garnef, the Supreme Priest of Khadin. His debut was actually in the game "Fire Emblem: Ankokuryuu to Hikari no Tsurugi" (or, roughly translated, "Fire Emblem: Dark Dragon and Sword of Light"), the first game in the Fire Emblem series. He was the original hero of the Fire Emblem series. Marth recently appears as a hidden playable character in Super Smash Bros. Melee for the Nintendo Gamecube. Here, all players have to do to unlock Marth is to use all 14 default characters at least once in 1-P Classic Mode or Vs. Mode, or fight 400 Vs. Matches. 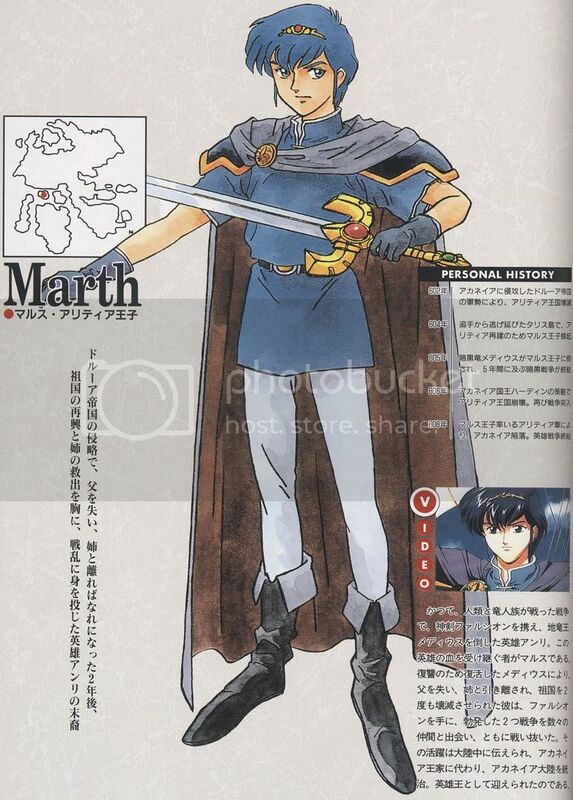 Marth plays a lot like Link (from the Legend of Zelda games) except he fights mainly using his sword. He is almost as fast as Captain Falcon (from the F-Zero: GP Legend anime and F-Zero games), and his moves are quick, though they don't pack much of a wallop. Marth is a middleweight character, meaning he's perfectly balanced in his weight and only gets smashed as far as Mario (from the Mario games), Link, Samus Aran (from the Metroid games), and other middleweights. He is also the only secret character to have a clone of his own. His clone is Prince Roy of Pharae, the hero of the Japanese-only Fire Emblem 6 game, whose father is Eliwood, a friend and teammate of Lyn, the heroine of the Fire Emblem 7 game, which was the very first Fire Emblem game to be released in America.